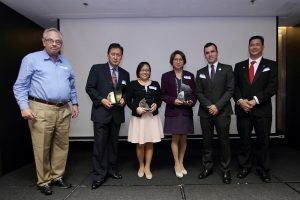 The Philippines’ economic forecast for 2018 took center stage during the 19th General Membership Meeting of the Israel Chamber of Commerce of the Philippines (ICCP) last December 13, 2017. In the meeting held at Dusit Thani Hotel Makati, Israel and the Philippines once again displayed their close bilateral ties and mutual interest in bilateral trade and investment. Government and business executives from both countries attended the meeting to discuss the country’s economic prospects and programs for 2018 and beyond. They discussed how the country’s economic performance would move forward and affect investors in the coming year. The forum opened the table for discussion regarding the Philippine government’s tax reforms and Build Build Build program. The guest speakers included Rosemarie Edillon, National Economic and Development Authority Undersecretary (Deputy Director General of the National Development Office – Policy and Planning); Mr. Jose Luis Yulo Jr., President of the Chamber of Commerce of the Philippine Islands; and Elsa P. Agustin, Department of Finance Director (on behalf of DOF Assistant Secretary Ma. Teresa Habitan). Director Agustin underscored the robust growth of the Philippine economy in recent years. The World Bank forecasts a 6.7 percent GDP growth by 2018 because of macroeconomic fundamentals such as manageable inflation, a stable banking system, fiscal discipline, and external stance. Despite the economy growing rapidly, however, there are still many factors to address. The country is still in need of more infrastructure investments as well as greater social services. For this reason, financing sustainable and inclusive development is a necessity. This type of development includes sustainable borrowings, budget reforms, tax and customs administration reform, and tax policy reform, Agustin said. Tax reforms are particularly important for three reasons: the low tax base, the lack of information because of the bank secrecy law, and the rigidity of the system. The tax reforms will bring about more tax exemptions and the non-indexation of fuel excise taxes. In other words, these reforms should contribute to a better economy and the fulfillment of long-term strategic development goals. The National Economic and Development Authority (NEDA) released the Philippine Development Plan 2017-2022 as part of the series of strategic development goals that will hopefully result in a prosperous nation by 2040. The long-term goal is to have a predominantly middle-class and high-trust society wherein the people are smart, innovative, and healthy by 2040. To make the goal more feasible, NEDA broke down the objectives into short timeframes. The agency aims for the Philippines to become an upper middle-income country by 2022. It projects a high level of human development, a lower unemployment rate, and greater trust in society and the government by then. Furthermore, the national government aims to enter a “Golden Age of Infrastructure” by 2022 by progressively increasing the current 5.4 percent of GDP to 7.3 percent during the next five years. The expected outputs of these national efforts include the construction of 7,956.87 kilometers of road, 155.01 kilometers of bridges, and 852 kilometers of new railways. They also include the construction of 169,734 housing units for low-income families, 16,079 barangay centers, and five treatment and rehabilitation centers. In addition, the expected outputs include the improvement of 482 hospitals, 18 airports and 122 seaports and fish ports. Local and foreign traders and investors will benefit from these goals most evidently through the rise of competitive enterprises. They will experience an increase in demand from the following industries: housing and urban development, manufacturing, connectivity, agriculture, tourism and allied services, and financial services. The meeting concluded with the induction of new chamber members, bringing a total of 120 members of ICCP.